Earlier this month, Baker lab researchers reported the computational design of a hyperstable 60-subunit protein icosahedron in Nature (Hsia et al); icosahedral protein structures are commonly observed in natural biological systems for packaging and transport (e.g. viral capsids). The described design was composed of 60 trimeric protein building blocks that self-assembled in a nanocage. In new work published today, Baker lab scientists and collaborators have taken this work to an exciting new level by engineering 120-subunit icosahedral nanocages that self-assemble from not one, but two distinct protein components. The new designed proteins are described in the latest issue of Science in a paper entitled “Accurate design of megadalton-scale multi-component icosahedral protein complexes”. In this paper, former Baker lab graduate student Jacob Bale, Ph.D. and collaborators describe the computational design and experimental characterization of ten two-component protein complexes that self-assemble into nanocages with atomic-level accuracy. These nanocages are the largest designed proteins to date with molecular weights of 1.8-2.8 megadaltons and diameters comparable to small viral capsids. The structures have been confirmed by X-ray crystallography (see figure). The advantage of a multi-component protein complex is the ability to control assembly by mixing individually prepared subunits. The authors show that in vitro mixing of the designed subunits occurs rapidly and enables controlled packaging of negatively charged GFP by introducing positive charges on the interior surfaces of the two copmonents. 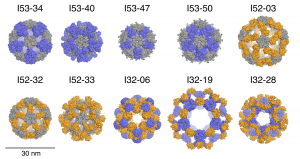 Nature provides many examples of self- and co-assembling protein-based molecular machines, including icosahedral protein cages that serve as scaffolds, enzymes, and compartments for essential biochemical reactions and icosahedral virus capsids, which encapsidate and protect viral genomes and mediate entry into host cells. Inspired by these natural materials, we report the computational design and experimental characterization of co-assembling two-component 120-subunit icosahedral protein nanostructures with molecular weights (1.8-2.8 MDa) and dimensions (24-40 nm diameter) comparable to small viral capsids. Electron microscopy, SAXS, and X-ray crystallography show that ten designs spanning three distinct icosahedral architectures form materials closely matching the design models. In vitro assembly of independently purified components reveals rapid assembly rates comparable to viral capsids and enables controlled packaging of molecular cargo via charge complementarity. The ability to design megadalton-scale materials with atomic-level accuracy and controllable assembly opens the door to a new generation of genetically programmable protein-based molecular machines.